In many places across the United States, Spanish is encountered at every turn - on street signs, on buses, at banks, at restaurants... even in your junk mail. "California" comes from Las Sergas de Esplandián, by Garcia Ordóñez de Montalvo, c. 1500. "Los Angeles," too, comes from Spanish, as do "Colorado" (red), "Florida" (feast of flowers, or Pascua Florida - Easter), "Montana" (mountain), and "Nevada" (snowcapped). It's no surprise, then, that Spanish is the most popular language learned at institutions of higher education in the U.S. The Modern Language Association reported 864,986 students enrolled in Spanish in 2009, with 764,340 students enrolled in all other languages combined during the same year. As soon as our students begin learning the language, they discover that they know more Spanish than they had originally thought. These fifty words are, of course, cognates - words in different languages that share a similar meaning and spelling because they originated from the same word. Adding to the ease of learning Spanish is that it is a phonetically perfect language, which means that once you learn to pronounce each vowel and consonant, you will be able to pronounce all words correctly. 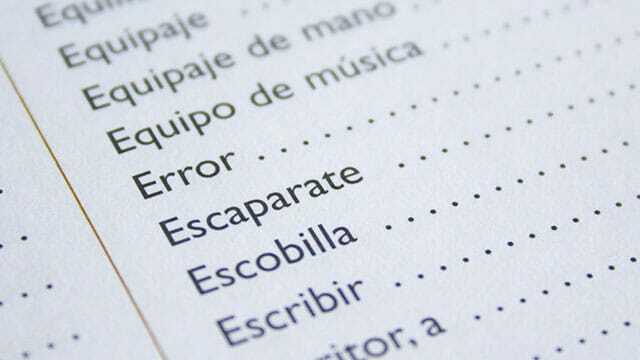 Spanish spelling is an exact reflection of the pronunciation of the language. The pronunciation of each letter is subject to precise and consistent rules, and words are pronounced by adding together the sounds of each individual letter. When learning Spanish, immerse yourself in the language and culture. Eat at Spanish and Latin American restaurants. Listen to Latin music: boleros, cumbias, flamenco, marengue, parsillos, pasodoble, salsas, sevillanas, son, tango, rancheras, and rock. Spanish Pop Singer Cristian Castro hit #3 on Billboard's Top Ten Hot Latin Tracks in 1999 with Por Amarte Asi. Go out to Latin dance clubs - you'll have fun dancing the night away. Go to Spanish movie festivals, and watch Spanish films. Read Spanish books and magazines. Try watching Spanish television. You won't understand it at first, but it might be fun to make it a game and to guess what is happening.